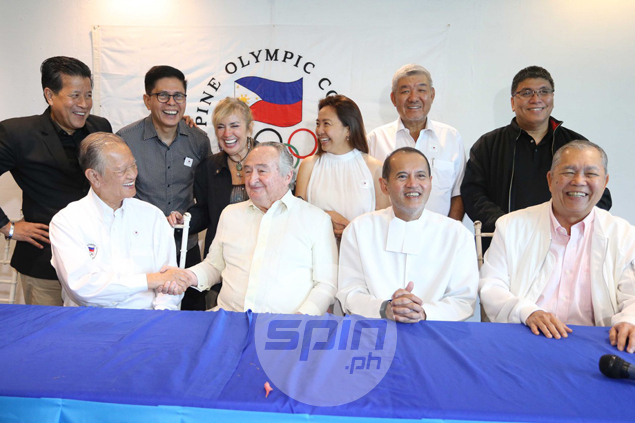 JOSE ‘Peping’ Cojuangco formally claimed his fourth term as Philippine Olympic Committee on Friday after winning the elections unopposed at the Wack Wack Golf and Country Club. Cojuangco got 26 votes from the 37 voting members present during Friday’s general assembly, as he officially got the mandate in the absence of an opponent after boxing's Ricky Vargas was disqualified from running by the POC election committee. All of the candidates under the Cojuangco camp also won in landslide fashion. Joey Romasanta of karatedo and volleyball won the first vice president post, 23-11, over Vargas ally Rep. Albie Benitez of badminton, while Jeff Tamayo of soft tennis beat Lucas Managuelod of muay thai, 26-11, for the second vice president position. Julian Camacho of wushu took the treasurer position after winning, 24-12, over Renauld ‘Sonny’ Barrios of basketball, 25-12. Jonne Go of canoe kayak ran unopposed as auditor and got 31 votes. Jesus Clint Aranas of archery (30 votes), Cynthia Carrion of gymnastics (30), Robert Mananquil of billiards and snooker (28), and Rep. Prospero Pichay of chess (27). Among the six voting members that were absent was Vargas, who had sought a Temporary Restraining Order (TRO) against the POC election but the petition was denied by the Pasig City Regional Trial Court on Thursday.